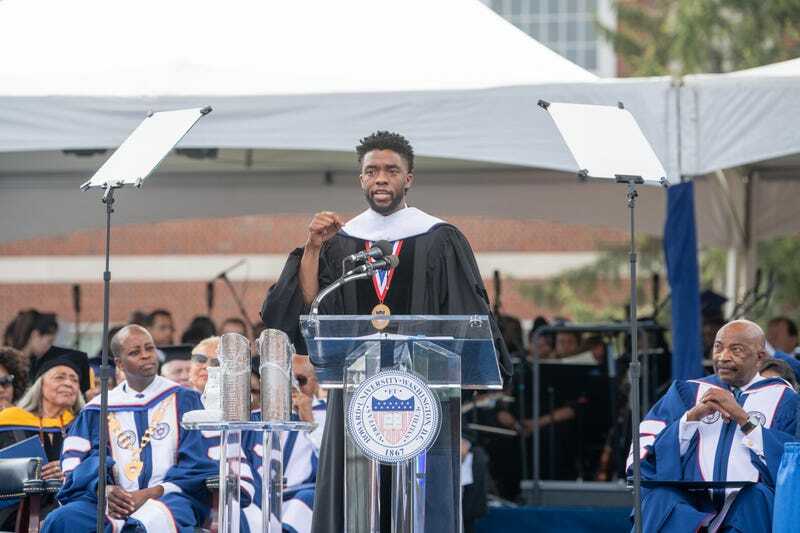 Alumnus Chadwick Boseman addresses the Class of 2018 during the Howard University 150th Commencement Ceremony on May 12, 2018, in Washington, D.C. In addition to a slew of notable African-American alumni, including Toni Morrison, Zora Neale Hurston and Phylicia Rashad, Howard alum Chadwick Boseman—the only Black Panther we acknowledge—was the 2018 speaker at the Howard University 2018 Commencement Convocation. Bosemen, who starred in the record-breaking film Black Panther, graduated from Howard with a Bachelor of Fine Arts degree in 2000. He encouraged the audience of more than 8,000 to seek purpose as they move forth in their lives. “When you have reached the Hilltop and you are deciding on next steps, you would rather find purpose than a career. Purpose is an essential element of you that crosses disciplines,” Boseman said. He recalled that one of his most memorable moments at Howard was when he met Muhammad Ali on campus.